For some years in the pleasure craft field we have been witnessing development, in both a design and commercial key, of a theme that is as fascinating as it is irksome: the question of "holing", which is to say opening up and glazing the yacht-system. Breaking down the latter into its two basic components, hull and superstructure, it is certainly with regard to the latter that there has been a continual evolutionary process in general design and opening up, seeking formal solutions that are characteristic and innovative. Contrarily, the air intakes or light sources of the hull have remained crystallised in their original form: the porthole. In the past, hull portholes and openings in the planking were little used to give air and light to the interiors. Deck openings were preferred, with skylights on the deckhouse roof or windows at the sides. Any opening that linked exterior and interior was treated with extreme caution: the protective shell of a vessel had little tolerance for being broken open in any way. Technologically the problems were both the flexibility of wooden planking, which did not permit extensive glazed areas, and the traditional mistrust of a material as fragile and delicate as glass. If we examine the evolution of hull openings over the last seventy years with regard to sailboats and motorboats we shall see how the design of the ship's sides remained unchanged in comparison with the evolution of superstructures. The reasons for this delay were mainly due to a traditional work set-up in the yard which envisaged a sort of clear division of duties between the marine engineer, who supplied the support, the hull "locked" into all its technical and regulatory components, and the creative architect or designer who provided for shaping the volume and surfaces of the superstructure, for dividing the interior spaces and creating them in a composition whose relationship with the hull was often problematic if not actually conflicting. 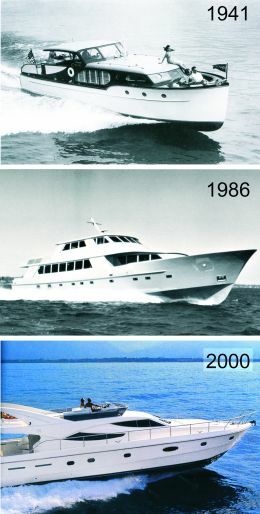 More than anything else, the two design phases were very often distant in time (it's still current practice to bring in a designer to work on a hull whose mould or design has already been in the yard's possession for some time), with the result of further detachment in style between superstructure and hull and the inevitable fallout of holing on the design. If to all this we add that the creative inspirations are of a different nature (the hull designed above all for optimisation of the technical, regulatory and performance aspects while superstructure design seeks aesthetic and formal solutions) we find yet another reason for the lack of homogeneity in compositional maturity. As noted previously, all this changed a few years ago: in the most recent productions we see an increasing compositional subdivision also with regard to the ship's sides. This is certainly the result of growing interaction between designers and technicians who interface continually in a single design project whose final synthesis is an increasingly integrated yacht-object. In this way research, style solutions and new materials experimented with on superstructures are gradually coming to be used on hulls. So portholes are becoming increasingly important on a vessel: from simple elements necessary to "survival" and psychophysical well- being below decks, today they have become actual "musts" for the shipyard's image, through which the brand takes on greater vigour and recognisability at sea and at moorings. Until a few years ago the porthole theme in yacht design aroused no special interest, probably for reasons dictated on the one hand by architects' and designers' stylistic research (aimed at putting forward innovative solutions in terms of interior liveability) and on the other by the yacht-building industry which gave no stimulus of a creative kind to porthole production. On this theme too the twofold concept of form and function has provided food for thought. The porthole is no longer dealt with as a complement per se, totally separate from the surface or volume of which it is part. Rather it is put into relationship with the yacht-object and has become a foremost element in stylistic and engineering solutions linked to interior and exterior architecture. In an increasingly open vision of the yacht-object, more extended towards the elements that house it, the porthole has become a means through which the outside world approaches the interior of the yacht and vice versa. So what does adoption of the form-function coupling mean? First off, we must break down the points of view from which the problem is approached: it remains understood that in tackling the problem, setting out from the interior of the yacht, we shall identify function as a pre-eminent aspect, whereas if we tackled the theme setting out from the exterior, the quest for style and a global architecture would lead to form taking on a great meaning and importance towards which the technical solutions would tend. The need for internal lighting, for paring down the distance between interior and exterior, between world on the surface and submerged world; a strong desire to equip shared areas with actual openings suitable to the internal spaces involved; owners' cabins rendered unique and recognisable from the outside by means of vast windows: these are only some of the themes approached by today's yacht designers. As mentioned previously, these parameters take account of needs dictated by the interior of the boat, while the trend towards increasingly intensified communication between external and internal worlds leads to ever greater controls over the bioclimatic aspects that intervene inside and outside the vessel. All this ensures technological research aimed at proposing new satisfactory solutions, but also themes scarcely thinkable even today. From the viewpoint of regulations, the problem for pleasure craft is conceptually simple. Portholes or glazed openings in general are treated as flexible sheets subjected to uniform pressure from the exterior towards the interior. Obviously the pressure calculation changes depending on the porthole's position on the hull and the use made of the vessel. At this point the problem would seem to be easily resolved: once the clear opening of the porthole and the external pressure it must bear are defined, you calculate the minimum thickness and order the piece. This is the practice for all "traditional" readymade openings which have a maximum clear opening of about 500 mm. The problem is considerably different when you want to increase the glazed area, perhaps in structurally critical parts of the hull. In such cases you must consider the deformability of the opening to which the glass is to be fixed, because a frame that gives way can cause big problems. Glass in fact possesses high rigidity (about 7 times greater than fibreglass, about 3 times greater than sheet carbon fibre) while the breaking load is similar to fibreglass. This fact produces certain disappointing effects in the case of large glazed openings or openings in the most stressed parts of the hull. In practice fibreglass, when subjected to the same external stress, is deformed to a far greater extent than glass. So if the perimeter frame is too flexible, or if the thickness of the structural fixing is insufficient, the glass will break due to excessive deformation. In these cases such problems can be avoided by careful design that also takes account of the overall "flexibility" of the hull, as well as by using transparent plastic materials instead of glass. These have a rigidity similar to fibreglass and therefore are better suited to deformable zones. Still in the pleasure craft sector, the regulations applicable today to yachts under 24 metres leave the designer great freedom. Big glazed openings in the hull have substantially only three limitations: first, it is forbidden to install open/close windows less than 200 mm from the waterline, for obvious reasons of safety; second, safety glass must be used (stratified, bullet- proof etc.) to avoid shipping water in the case of external impacts; and third, the opening must be partitioned at centres no greater than 300 mm. The theme is variously interpreted by shipyards. Consider the Azimut 86 S and the Ferretti 881. Both yards have created a distinctive ship's side with the opening of a large glazed area near the waterline, but technically the solutions follow two different philosophies. In the case of Azimut it is not an actual interruption of the side since the six windows are fixed to a vertical and horizontal reinforcement grille and the windows are moreover permanently closed. With Ferretti the interruption of the side is more significant and the glazing (one single panel) is fixed and supported by vertical reinforcements. Two portholes at the sides can be opened. In practice the Azimut is more conservative and retains the integrity of the ship's side to a greater extent, while the Ferretti solution has more internal visibility but requires additional reinforcements in the opening zone. It's a different matter when we analyse the requirements of International Class Regulations or the MCA regulations for superyacht pleasure craft. In this case the regulations impose minimum thicknesses depending on the clear opening of the glazed area and on the part of the hull where the opening is situated. Over and above the decidedly more generous sizing in comparison with EC vessels, the class regulations also impose restrictions regarding the type of frame to be used, the maximum area of each opening etc. To overcome these (traditionally conservative) standards limitations designers in recent years have had increasing recourse to finite elements structural calculation, both to highlight the most suitable zones and to justify certain innovative solutions to international register inspectors. In 1996 the yard Chantiers de l'Atlantique built the ferry "Napoléon Bonaparte" which, for the first time, had an actual glass ship's side the height of four between-decks. That important sign contradicted the structural principal of external continuity and threw down an open challenge to designers: to create vertical openings on several between-decks without reducing the longitudinal robustness of the hull. Subsequently the cruise ship sector began to explore the possibility of creating transparency between the interior and the outside environment, to the extent of arriving at panoramic stairways and lifts in the ship's side. An interesting inspiration for the future is controlled transparency openings where a variable quantity of light may be admitted either through variable opacity glass (e.g. Cromalite© Isoclima) or by means of mechanical screening.